China, Europe and Britain loosened monetary policy in the space of less than an hour on Thursday, signaling a growing level of alarm about the world economy, although suggestions of coordinated action were played down. Of the three, the surprise move was from Beijing which lowered its lending rate by 31 basis points to 6 percent following an interest rate cut just a month ago which also came out of the blue. 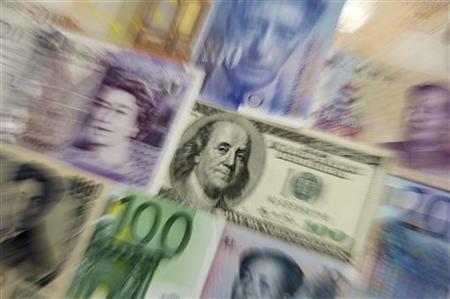 The European Central Bank cut rates to a record low 0.75 percent following a dire run of economic data. But it steered clear of bolder moves such as reviving its government bond-buying program or flooding banks with more long-term liquidity. The Bank of England, whose rates are already at a record low 0.5 percent, said it would restart its printing presses and buy 50 billion pounds ($78 billion) of assets with newly created money to help the economy out of recession. “It is a surprise that they are moving so quickly. It shows that policymakers’ concerns about the global economy have only grown,” Mark Williams, an economist at Capital Economics in London, said of the People’s Bank of China’s action. A raft of Chinese data is due next week including second quarter GDP which officials may know to be poor, he said. But they may also be trying to foster suggestions of acting in concert. In Frankfurt, ECB President Mario Draghi denied any globally coordinated central bank action of the sort seen after the collapse of Lehman Brothers in 2008. “On coordination, no, there wasn’t any … that went beyond the normal exchange of views on the state of the business cycle, on the state of the economy, and on the state of global demand,” he told a news conference. The U.S. Federal Reserve holds its next meeting on July 31 and August 1 while the Bank of Japan meets next week. Last month, the Fed held off on another round of bond-buying but its chief Ben Bernanke said there was “considerable scope to do more” and Wall Street bond firms polled by Reuters saw a 50 percent chance of another asset purchase program. In recent weeks, economic evidence from Asia, Europe and the United States has pointed to a world economy running out of steam. China’s economy is widely expected to record its sixth successive slide in growth in April-June. Purchasing managers surveys this week showed all of Europe’s biggest economies are in recession or heading there, while a parallel U.S. survey on Thursday showed growth in the U.S. services sector slowed in June to a 2-1/2-year low. All the major central banks, with interest rates at historic lows, face the law of diminishing returns. The Bank of England had already created 325 billion pounds of new money before Thursday’s addition. In doing so, it has successfully driven borrowing costs to all-time lows, yet the UK economy is languishing in recession. “The BoE has been excessively optimistic about how powerful QE is,” said Philip Rush, an economist at Nomura, referring to the money-creating strategies known as qualitative easing. The euro zone is no better off. “We see now a weakening basically of growth in the whole of the euro area, including the country or the countries that had not experienced that before,” Draghi said. Policymakers could counter that things would be much worse if they had not acted, but with most monetary policy levers already pulled, government action is also required to improve the world’s fortunes. The International Monetary Fund has urged the United States to quickly remove the uncertainty over the path of fiscal policy, which is set to tighten abruptly at the start of next year without congressional action. The IMF, and others around the world, also continue to urge the euro zone to get on top of its debt crisis once and for all. Measures announced at a European summit last week bought some calm with the promise of action to lower government borrowing costs, but economists say they did not tackle the root problems, which still pose the biggest risk to the world economy. “In spite of the progress made at the latest European Council, concerns remain about the indebtedness and competitiveness of several euro-area economies and that is weighing on confidence here,” the Bank of England said after its policy meeting on Thursday. The ECB continues to put the onus on euro zone governments to solve their debt crisis and did not even discuss on Thursday “non-standard” measures such as buying Spanish and Italian bonds to lower borrowing costs which are not sustainable indefinitely. Elsewhere, Denmark’s central bank cut interest rates by 25 basis points, shadowing the ECB’s action, in a historic move that put one of its secondary rates into negative territory for the first time. Kenya ended its nine-months-long hawkish stance with a bigger-than-expected 150 basis points rate cut. The sweep of policy action shows many markets are in the curious position of welcoming poor economic data, or at least not selling off on it. “The enthusiasm as a result of the EU summit last week has faded but … we’re in a situation where poor data is not necessarily bad news for commodities because it’s more likely to lead to more quantitative easing and other monetary easing,” said Stephen Briggs, analyst at BNP Paribas. This entry was posted in Article, Links, reblog and tagged 2012, 5 July, Disclosure, Earth, news, Pat Donworth, spiritual, Spiritual evolution, Trio Of Top Banks Leap Into Action In Sign Of Alarm, World. Bookmark the permalink.